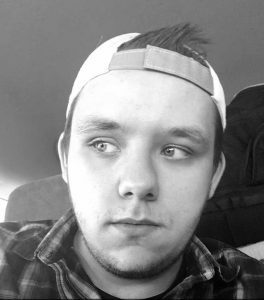 Tom, age 20 from Colorado Springs, CO, graduated from the Professional Welder program at Tulsa Welding School in April 2018. Thanks for your time, Tom. Did you go to welding school out of high school? I took about a year off. I wasn’t sure what I wanted to do. My mom knew I’d come to the realization that I’m 18 or 19 years old and working at a pizza shop. For about six months after graduation, I partied, played video games and sat at home. She was right, I finally realized I was turning into a lazy, sour guy. What changed? Why did you choose to come to Tulsa Welding School? When I was working in a donut shop, this guy walked in wearing a TWS blazer. I used to small talk with the customers, so we started chatting. He asked me what I knew about welding; I told him I had about two years of experience in high school. He said, “Well you’re making my donuts. How far did that get you?” A week later, he was sitting in my living room interviewing me for Tulsa Welding School! Had you considered welding as a career before that chance meeting? It was in the back of my mind while going through vocation in high school, but I had other interests. I wanted to make money playing guitar, and I had dreams of being a professional gamer. There were a bunch of things I thought were out of reach, and honestly, I thought welding school was one of them. I applied in November 2016 and didn’t enroll until August 2017 because I was so nervous about it. I don’t come from a rich household. I’m the first kid of three to go to college or trade school. My mom, a single mom, has worked hard her entire life to raise us. I had to convince her that I was saving up money, buying a car and getting my act together, and in six months was going to drive to Oklahoma for welding school. How was being 19 and away from home for the first time? It was a crazy experience. No one can prepare you to be an adult! When I moved out, I learned so much. I really wished I’d done the dishes more often before I moved out, because there’s not a dishwasher fairy that floats around the house at midnight! I was a completely different person eight months ago. I was so lazy before I came to TWS. No one can tell you that paying bills is going to be easy and ends aren’t always going to meet just because you want them to. I was naïve thinking it was just going to fall into place. Then I realized I had to work two jobs and go to school full time. TWS taught me what a work ethic really is. You have to apply yourself. The whole experience really trained me to chase what I want. Number one was the faculty and staff. There are so many resources you can utilize. There are people in Career Services whose sole job is to find you a job! If that doesn’t say something, I don’t know what does. And I don’t just mean a welding job. They helped me get a part-time job at Wholefoods. They helped me find a job at a warehouse. The instructors were all awesome. If you can’t find the answer to a question, then you’re doing something wrong. They’re all there to help you. How did you feel when you graduated? I felt like a professional. I had all of the basics down to a fine art. I knew how to critique and how to correct myself. Really, that’s what welding is all about. Nobody can hold your hand and weld a pipe for you. They can tell you what you’re doing wrong, but it’s up to you to have the discipline to correct yourself and be very critical of your own work. If you’re not, you’re not going to create a sound weld. I’m a structural welder with Peak Custom Fabrication in Colorado Springs. Right now I’m working in a new hospital, installing booms for x-ray lights that weigh about 1000lbs. If you’re a patient and a radiologist swings an x-ray over you, I’m making the support for that light. 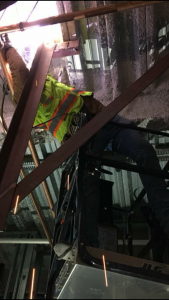 I’m welding those up into the ceiling of this hospital. Christina Smith [in Career Services] said she knew a guy who knew a guy with a shop in Colorado Springs. She tracked down a number, and the next day I got a call from Peak Custom Fabrication asking me to come in for a weld test. I took the test when I got back home the Monday after graduation, and the following week I was working. Career services helped me test for three different places while I was in school. I tested for Ingalls in Mississippi, but I didn’t want to go down there. They also helped me with a Department of Defense job in Indiana. Unfortunately, I busted the tests for the military because I wasn’t familiar with the process, but that’s alright. Where do you hope your career will take you in the next three years? The people in Indiana called me back just a few days ago saying there are more opportunities, so I might go back up there for an interview. Pipe is where the money is, and pipe welding is what I love to do. Three years from now, I’ll be welding for a big contractor going from job site to job site pipe welding. It’s one of the most humbling things you can do. It’s so hard to do well. It’s a perfectionist’s trade. If you get a big head about it, you’re probably not very good. You have to push your ego aside. If I make a bad weld, do you want to be on that table under that light one day? Or would you rather I set my ego aside and tell the guys that I made a bad weld and do it again? How excited were you to get your first welding pay check? I was in bed on a Wednesday night, and I got a notification from my bank saying I have a deposit, available tomorrow. It was what I used to make in a month, and I’m making it in two weeks! For a 20-year-old guy living with his mom trying to save money, it’s a lot of money. That’s when it finally clicked that hard work pays off. The money only goes up. Now that I’ve been here a month, the overtime will start to kick in! I tried to give my mom my first paycheck, but she wouldn’t take it! I’m really excited about working the pipe lines, and this job opportunity in Indiana might pay three times what I’m earning now! Utilize the resources—your teachers and career services. They are there to help you 100%. You’ve got to be confident, ask questions, talk to them and show them that you want it. These are people who are going to help you be successful. If they don’t know your name they can’t help you. If you don’t want it, you’re not going to get it. All I did for the last seven or eight months is just grind. I was so task-focused. I jumped in with both feet and I got what I wanted out of it. If you’re sitting out in the TWS parking lot, smoking and drinking beer, taking 90-minute breaks, you’re not going to be a welder.